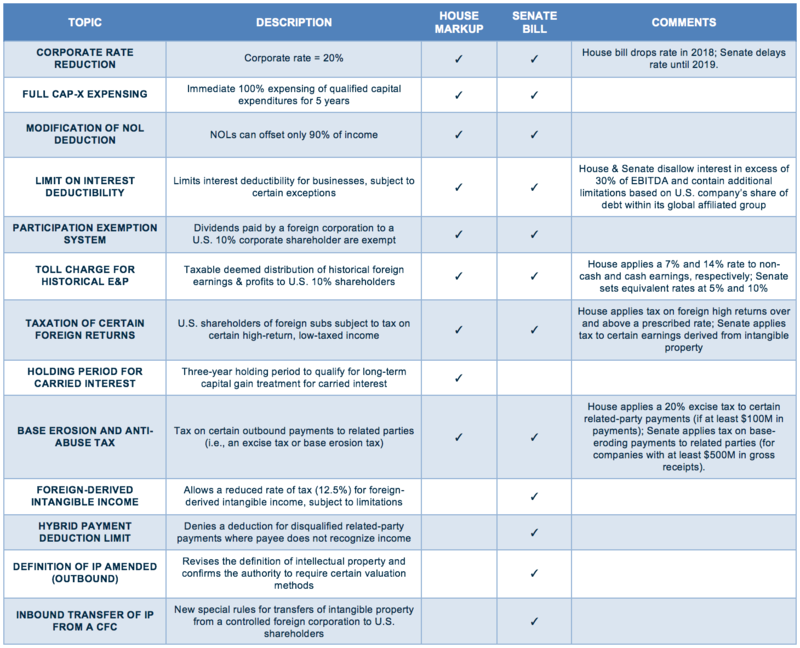 As expected, the Senate Finance Committee released its initial tax reform proposal on Friday. Separately, the House Ways and Means Committee put out its final legislative markup (the night before). Yes, we now have two bills to evaluate. Thankfully, you will see many overlapping provisions. On the other hand, expect challenges following the legislation, as each chamber of congress is introducing its own unique game-changers, and both bills add a ton of new complexity for multinationals. We suggest corporates use the chart below to monitor the international provisions of both bills. We also recommend using high-level analytical tools to quickly assess the comparative impact of the bills through the remainder of the legislative process (as we are also doing with our clients). And finally, we suggest corporates immediately identify potential year-end planning techniques and action items, especially considering the high likelihood and overlapping provisions of the bills. A new base erosion and profit shifting (BEPS)-inspired tax penalty on corporates using hybrid entities or instruments. Both proposals go a long way toward making the U.S. a more attractive place for multinationals to do business by reducing the corporate tax rate to 20%. The Senate proposal takes a step further by directly inviting U.S. multinationals to bring intellectual property back to the U.S. tax-free, coupled with an even lower rate on foreign income from intellectual property (12.5%). Both chambers have come up with innovative proposals to “level the tax playing field for U.S. multinationals,” by eliminating or offsetting tax advantages that have been available only to foreign multinationals. See here for our deck covering all the provisions of both bills. Today (Monday): The Senate Finance Committee begins its own markup phase, expected to last the week. This week: The House expects a floor vote by Thursday on the final markup bill from the House Ways and Means Committee. As more details emerge from both chambers, look for coming posts from A&M Taxand with our proactive insights and thought leadership. Here at A&M we see two important issues notably missing in the public discussion over the release of the Tax Cuts and Jobs Act. One issue pertains to investors and the other to tax leaders. The various tax proposals share a number of common elements, but also have several unique provisions. Until draft legislation is available, companies with US activities will have many questions as to the impact of potential tax reform. Today, the House Ways and Means Committee released the statutory language and detailed explanation of its long-awaited, 429-page tax reform bill, the Tax Cuts and Jobs Act. This bill is the culmination of more than a year of anticipation and speculation about competing plans, from the 2016 House Blueprint, to candidate Trump’s plan, to President Trump’s April one-pager and most recently to the September Framework proposal. We are feverishly reviewing the package for our clients; watch for coming editions of Tax Advisor Weekly where we will share our planning insights.